Today’s generation like speedy games. The game temple run is one of the most favorite games of everyone. Its and endless running game with lots of challenges. I have seen many people who use to play this game for many hours. Few of my friends love this game and I have caught them in classroom. But don’t you think that playing same game again and again will decrease the intrest of game among all. I think there must be so alternatives so this game so that we can take the pleasure of speed and fun in different tastes. 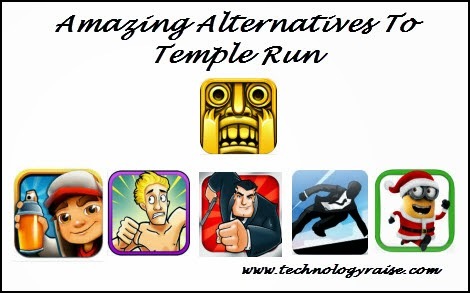 So in this post we will focus on six best alternatives to Temple Run. 1. Subway Surfers: - This is also an endless running game with lots of speed and challenges. The best thing of this game is that you have to pass various incoming challenges. There are many props which you can use while playing this game. This props are skate board, paint jet, magnets, high jump shoes etc. There are many avatars in these games and for choosing any of them you have to cross few challenges and earn sufficient number of coins or props. In this game you also have to pass weekly and monthly challenges and on its basis you get some reward. You also get some keys and with the help of these keys you can unlock your defeated i.e. if you are defeated then there is an option available for few seconds and with the help of that option and some keys you can return your avatar back in the game. This game is available for Windows phone, iOS and Android platform. You can download this amazing game from here. 2. Streaker Run: - This is another endless running game which aims at testing your reflexes and nerves. In this game you have to run along yards and you can also run on roofs. Sliding, jumping and turning aside obstacles are also fun in this game. This game aims at collecting gems, grabbing Power- upds, winning Bucks and buying Toy Rides for avoiding defeat from big bruiser. Here big bruiser is always hot at your trails. You also have to save your avatar fro Zombie who is in search of brain to fulfill its hunger. To download this game for android you can click here and for iOS devices, click here. 3. Agent Dash: - This game is an explosive running game of Google. In this game your only mission is to kill as much villainous as possible. While doing this you have to pass through amazing environment by taking help your secret avatar skills. You also have to save your avatar from harmful laser beams, falling trees, lava etc. You have permission to use your spy gadget, parachutes etc. But you have to complete this mission is desired time otherwise you will be failed. You can download this game for Android and iOS. 4. One Epic Knight: - Are you searching a game that always leaves you feeling EPIC? If yes then your search is over now, as with this endless running game you are going to enjoy a lot. You have to go in endless dungeon crazy traps, creatures and chasms. You have to do all these things in pursuit of almighty loot. This game is also available for iOS and android. 5. Vector: - This arcade style game is amazing. It’s a free running game. This game begins with a view of totalitarian world and in this world freedom is not more than a distant dream. But the heart of your avatar is very strong and soon you will break free in this game. Vault, slide, climb and run are amazing techniques used in this game. But you have to practice a lot to gain perfection. Download this game for Android and iOS platforms. 6. Despicable Me: - Various characters like Minions, Gibberish, yellow and Gru’s loyal are ready to face the toughest challenge of this game. This game is completely based on speed and presence of mind. So first you have to impress your boss in this game and then you have to explore your different skills. You can play this game on Android and iOS.